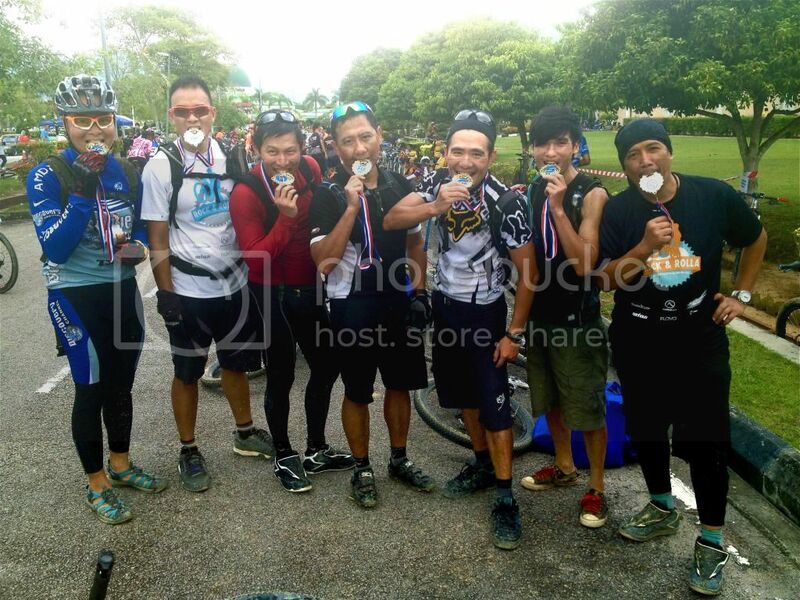 Batu Pahat Jamboree is an XC race that many Rock and Rolla (RnR) members like to talk about, for the endless tortuous climb that challenges even the most experience mountain bikers. It has become an unspoken mission for some of us to experience at least once in our riding life. 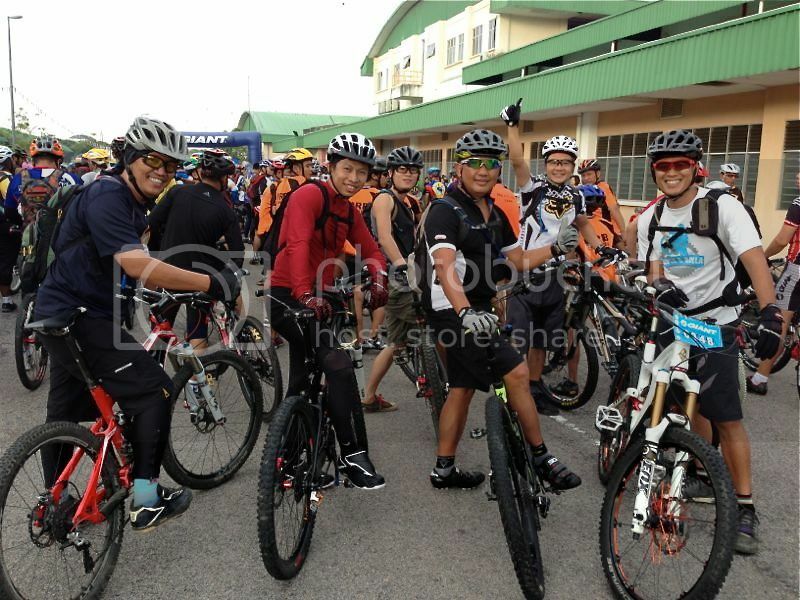 I was excited that 15 riders from the RnR registered for the race, the biggest ever turnout. Immediately after Johor Bahru Jamboree in October 2012, we started to train for Batu Pahat Jamboree that would be held on 11th November 2012. Unfortunately, monsoon season falls on November, and flooding was reported in Malaysia including Batu Pahat. 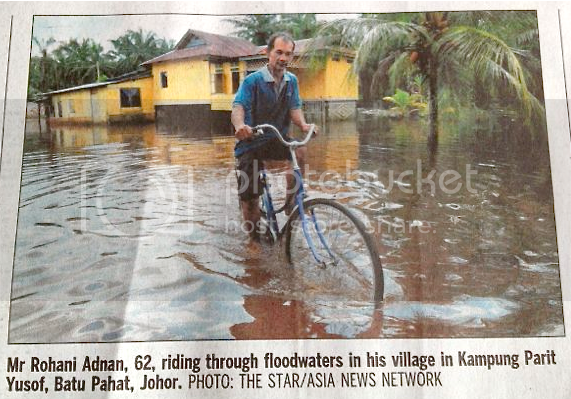 Many villages in Batu Pahat were affected by floodwater. The organizer assured us that the race venue would not be affected. However, he (Mr. Teo) cautioned us to expect muddy and slippery trails. Worried that I might not be able to clip-in muddy cleats, I decided to replace my SPD with flat pedal. A decision that I would regret later. 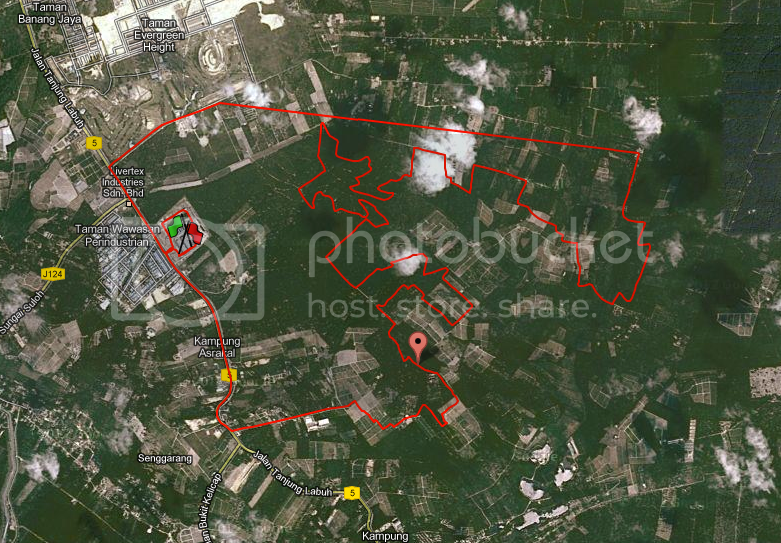 Batu Pahat is about 160km from Singapore. Zhi Cong and some riders drove there one day before the race to get a fresh start, while others like me drove there on the race day. For those who travelled on the day of the race, sacrifice of sleep was imminent. Most of us woke up by 3am, and proceeded to Calvin house by 4am so that the convoy (3 cars) could leave for Batu Pahat by 4.30am. This would give us amber time to register for goodie bags and fix up race number before the race at 8am. On the way to Batu Pahat, we stopped twice to freshen up and had our breakfast. As I was having stomach upset possibly due to Chinese medicine (for cold cough) I took the day before, I decided to skip breakfast. I was more concern about running to the toilet half-way into the race than race with an empty stomach. One of the right decision we made was to get hold of 2 walkie-talkie for ease of communication. 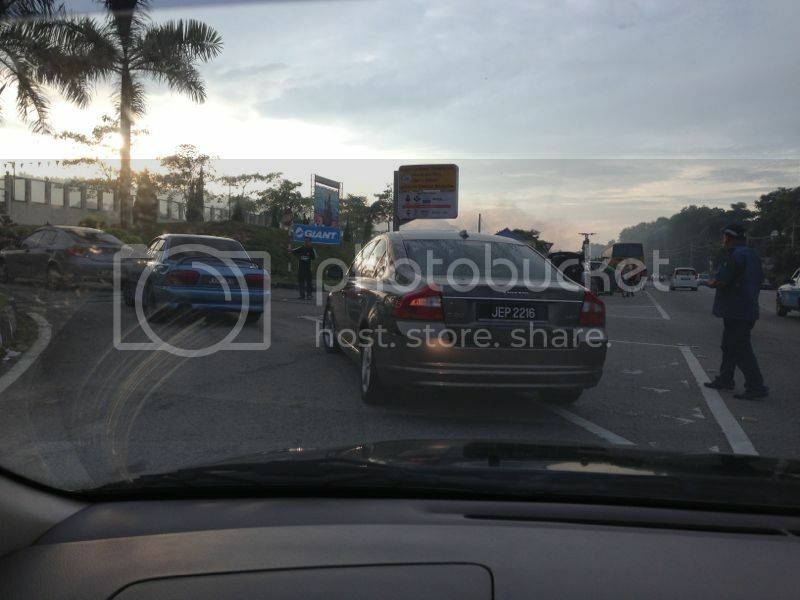 We were having fun talking to each other while driving to/fro Batu Pahat. We arrived at the destination about 7.45am, just 15 minutes before the race start. We could have comfortably arrived at 6.45am. I think we spent too much time having breakfast during the 2nd stop. We had also underestimated the jam along the trunk roads. The huge number of participants (about 1000+) had added up to the bottleneck while we were trying to locate a parking space. Good learning experience for us, especially for popular race that have more than 1000 riders. Fortunately one of our team members Zhi Cong (Photo: left standing) who arrived one day earlier collected goodie bags for all of us. 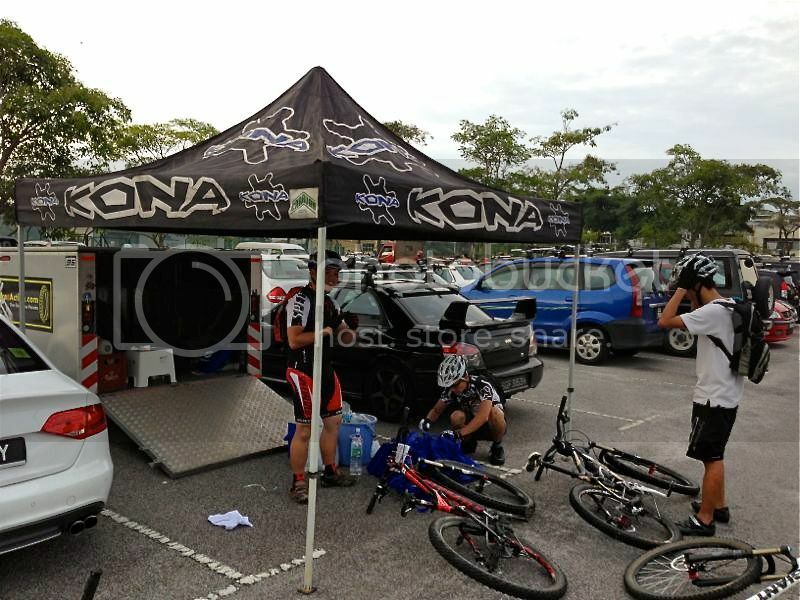 In fact, he came with a trailer and setup the Kona tent. It looked very professional. I (Photo: middle) was racing against time sorting out the race tags. As we were running out of time, we decided to grab any number tag that came along. If Zhi Cong have not assisted us, he would have queued in front of the start line. My sincere thanks to Zhi Cong. Although we were far behind the start line, our spirits remained high. We were chatting and taking photos until the race start. We met familiar faces such as Kaiser, the cyclocross rider from Riderbrothers. The start was smooth. The trails were forgiving and non-technical. The climbs were steep and long, many sections were paved with loose rocky stones. Due to monsoon rain, some of the sections were muddy and slippery. You could see algae all over the trails, perfect medicine for crashes. The race distance was planned for 45km, but it was reduced to 28km possibly due to flooding in certain sections of the trail. We were disappointed, as no one informed us about the changes before the race. If we were told earlier, we would have re-strategized our pace. I only knew about the changes near finishing line. By then, all my reserved energy went to waste. We would have increased our throttles after checkpoint one. Unless you queue at the front of the start line, even if you rode an electric bike you would still need to push up the slope. Just look at the number of riders in front of you pushing up the hill. Every single inch was blocked, how were you supposed to pedal up? To be fair, the climb were long and torturous. You need excellent mental strength to pedal up the hill. Technically, the climb in Batu Pahat were not as bad as that of Dato Onn in Johor Bahru, where you saw climb after climb. Almost all the climb in Batu Pahat were followed by downhill sections, the feeling of 'light at the end of the tunnel' was very real. At Dato Onn race, there was no 'light at the end of the tunnel'. The good news was I could proudly broadcast that I clocked maximum speed of 63.7km/hr on mountain bike. 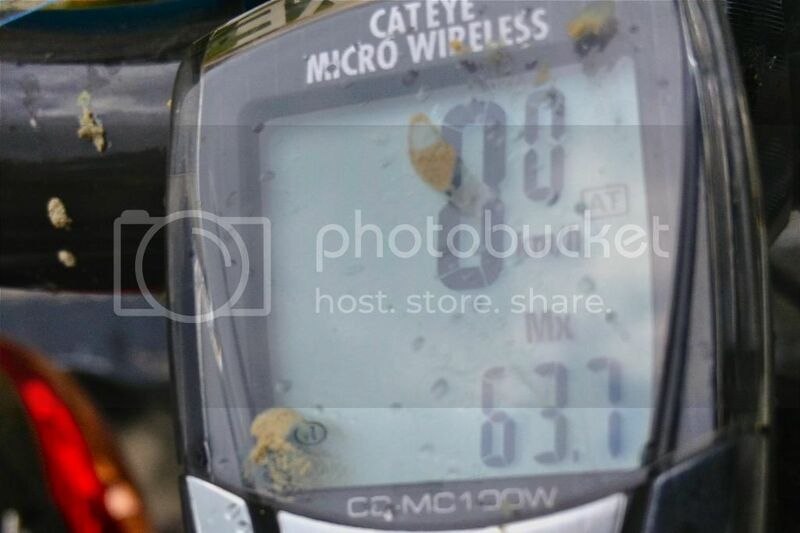 This speed was achieved after checkpoint 3, along the bowl shape concrete road leading to the main road. If riders did not achieve this speed during the down slope, he or she would probably need to push up slope later. This is the the infamous chicken lorry. No riders with pride would want to go in. It was called lorry of shame. Surprisingly, most of the bikes in the chicken lorry were 29ers. In this photo, we saw three 29ers out of 4 bikes. It has proven my hypothesis that 29ers are meant for strong riders who could take advantage of the larger wheels. Definitely not for weaker ones. After the race, we were having a good old chat and trumpeted about the race. 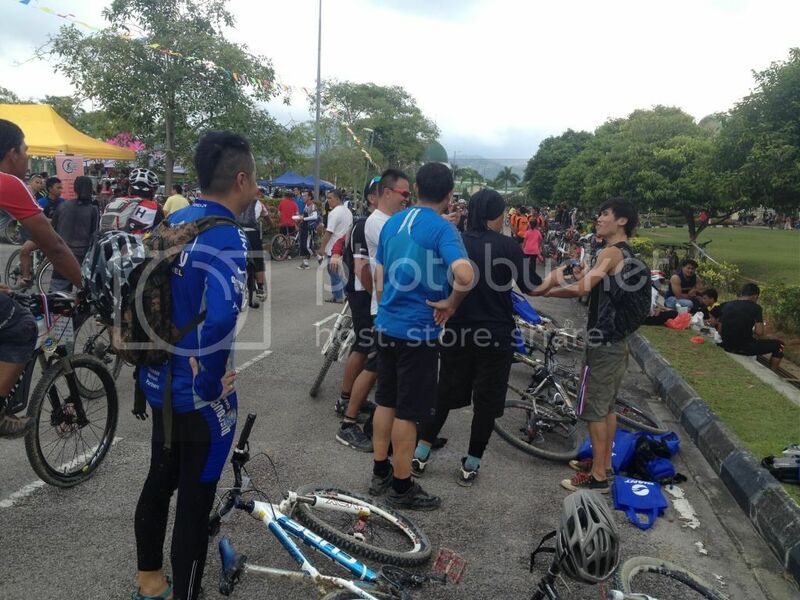 We realized Robert Lim arrived late and took the chicken line after checkpoint one because he had a flat tire. He was riding a full suspension freeride bike in XC race, respect! We did not get to meet the rest of the Sunday group as they were still trying to play catch up game. After all, the race is not about wining, it is about bonding and having a good time with like minded people. Ang came in first with an impressive 216th position out of more than 1000 riders in the OPEN category. Ang is the only one in our group who wore a pair of sneakers (no sock) in the race. In fact, he might be the only one in the race who did that. Ang has proven to us that you need not be in clipless, ride top of the line bike and wear top of the line gear to ride fast. However, I think if Ang wore clipless he would have easily achieved top 100 position in the race. Ang was riding CUBE full-suspension XC bike with flat pedal during the race. He has my utmost respect! Zhi Cong (not in the photo) came in 236th position, an impressive result consider he has yet to be enlisted in the army. 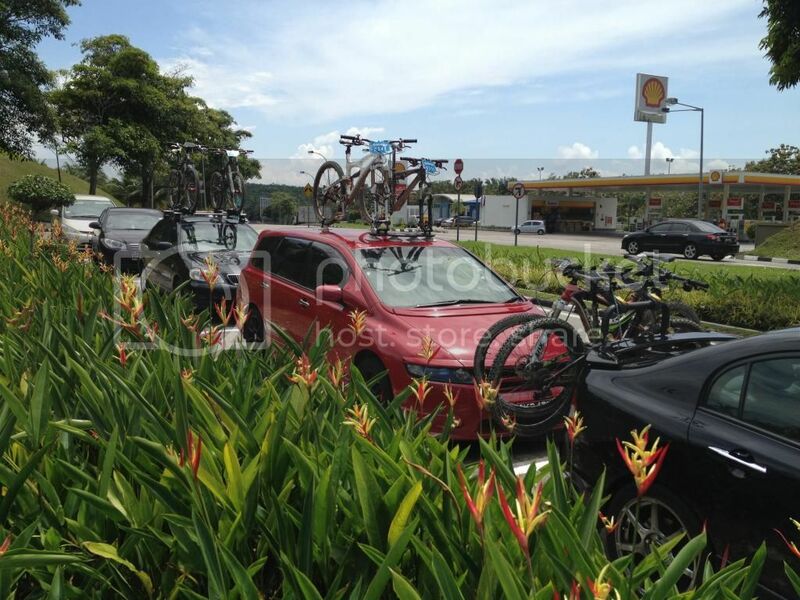 Zhi Cong was riding full suspension specialized 29er with clipless during the race. Zhi Cong is a young man with many more productive years to excel. Halil my idol came in 307th position! He is 5 years my senior and put many young riders to shame! Although he has chronic high blood pressure and under medication, Halil excellent riding skill and experience made him one of the best XC riders in RnR group. However, Halil remains humble and keep low profile about his talent. Halil was riding a polygon carbon full-sus XC bike with clipless during the race. This is Raymond first overseas Jamboree race, and he achieved an impressive result of 313rd position. Raymond trained hard and deserved the result he achieved. Raymond background is enduro and trail, which help to build his mental strength to overcome those endurance race. He has potential to achieve better results with the right bike and training. Raymond was riding a specialized double crown long travel full suspension bike with clipless during the race. Impressive! I came in 329th position. I could have performed better in this race. Not in my top form, but happy to be in top 30%. 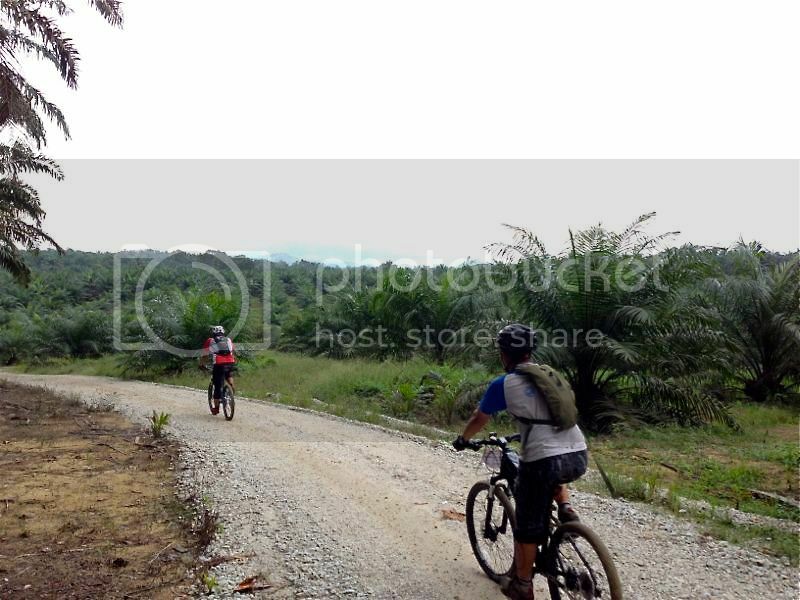 I was riding trek full suspension trail bike and flat pedal during the race. Hakim is my riding's mentor. Despite his age and medical condition (titanium man), he managed to beat most of the young men in the race. Hakim is inspirational, and many members in the rider group were motivated by him. 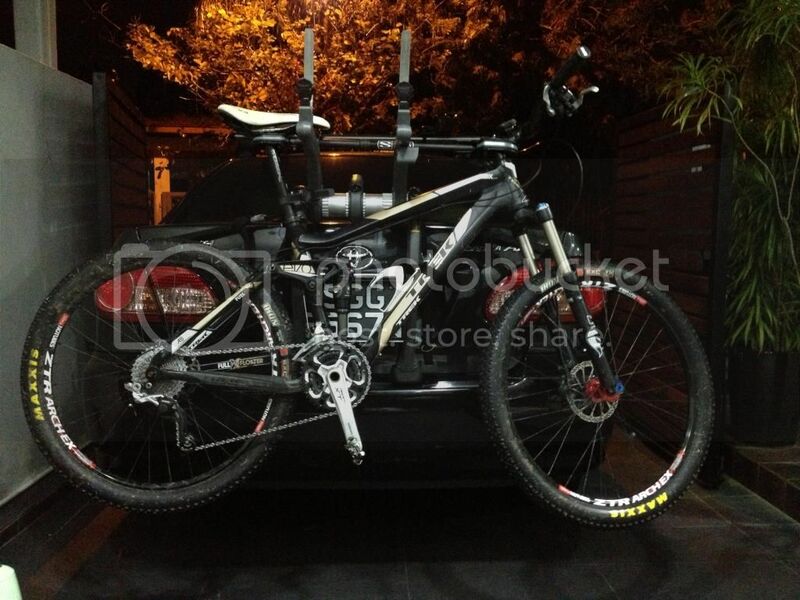 Hakim rode specialized full suspension 29er trail bike with clipless. Calvin is our chief in RnR riding group. Despite riding all mountain bike with 160mm travel and single chain ring (28T), he managed to finish an impressive 413 position! He would have beaten many of us if he used XC bike for the race. Calvin rode a full suspension Mojo all mountain bike with flat pedal. Similar to Zhi Cong, Melvin (not in the photo) is still a student who has many more years to excel in mountain biking. Being able to finish top 37% in Batu Pahat Jamboree against many seasoned riders is an achievement he would be proud off for many years to come. Melvin was riding full suspension trail bike with flat pedal during the race. Lester is a DH rider with strong motocross background. His GT DH machine was heavier than all our DH bikes, but he used it as all rounded machine. Lester put many XC riders to shame as well. 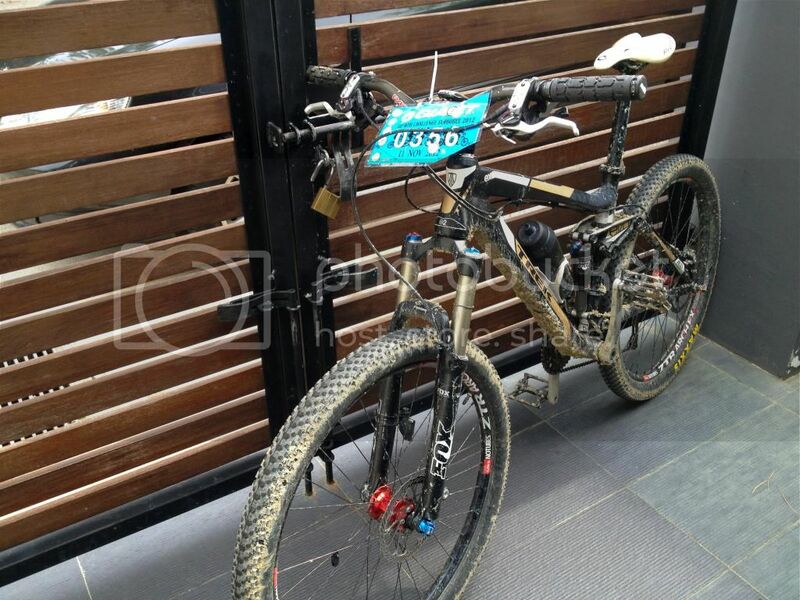 Despite late start, he managed to finish an impressive 454th position with his newly setup hardtail XC bike. It must be the training he got from the heavy DH machine. Lester was riding CUBE hardtail XC bike with flat pedal. during the race. Danny (not in the photo) is one of the most active members in the RnR Sunday group. 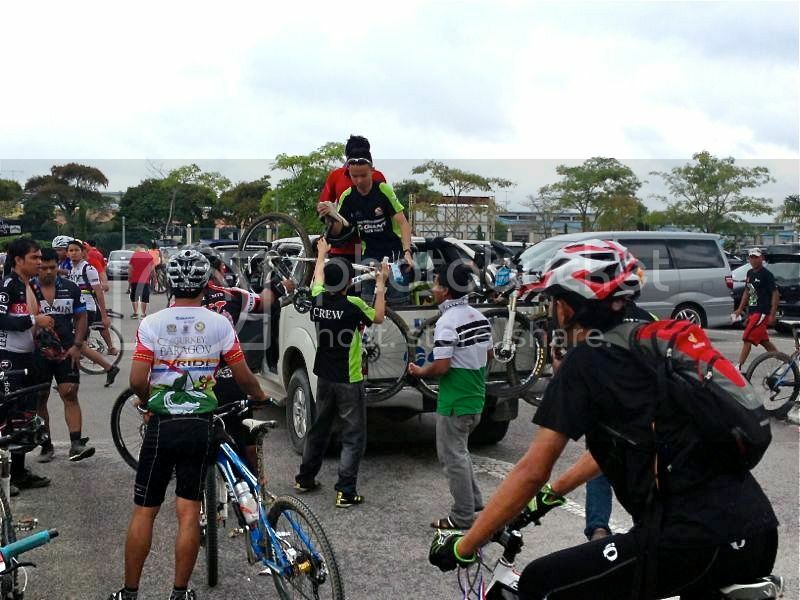 He volunteered to pick up some of the riders to Batu Pahat race. Due to unforeseen circumstances, he nearly could not make it to the race. This is Danny's first overseas XC race, and it was commendable to achieve 593 position. Danny was riding a polygon carbon hardtail XC bike with flat pedal during the race. Similar to Raymond, this is Nick (not in the photo) first overseas Jamboree race. He had a late start, the price he paid for being late. Similar to Calvin, Nick was riding all-mountain bike in the race. He achieved a finisher position of 718th, commendable considering all the circumstances. My respect to him for not giving up. Well done! Nick was riding specialized full suspension all mountain bike on flat pedal. After the race, we did not stay for food or the lucky draw. Instead, we drove to one of the resting points along the North-South highway to have our well deserving lunch. 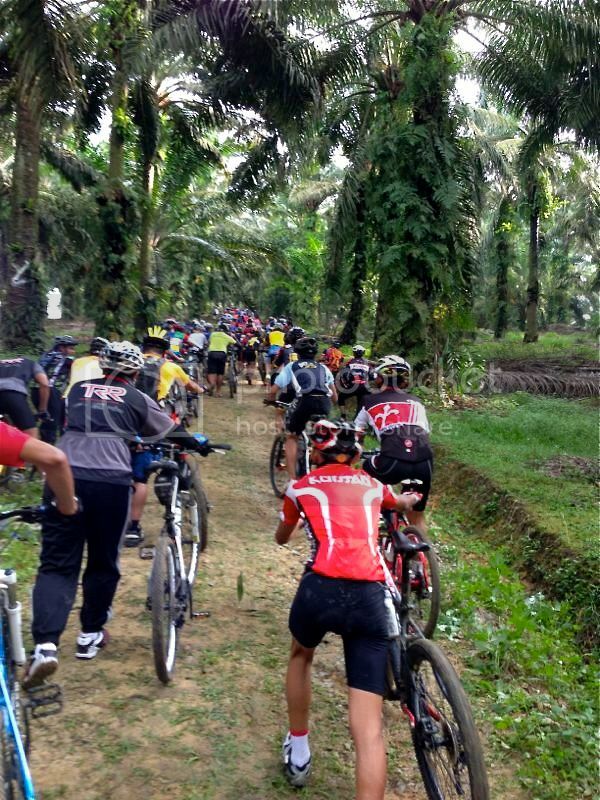 One lesson I learned in Malaysia during the XC race, never shout "bike" when you intend to overtake someone. It only works in Singapore. Instead, shout "rider" when you are in Malaysia. Calvin house has became the unofficial washing point for bikes after the race. Very generous of him. He even provided brushes and muff off shampoo. Calvin should install a coin box outside his house. In the spirit of brotherhood, I would advise he exclusively offer this privilege to RnR members only. This is my trustable race machine. As usual, I saw many branded bikes broke down half way down the race. In order to avoid such mishap, I always service my bike before the race. Peace of mind. Chris, this is one race that I will remember for a long time. Enjoyed myself totally and thanks for organising. I like your blog about the Chicken lorry, or Lim refered it as Chicken Run. Nobody told what was it and been new to Jambore, I have no idea what was it. Now that I know, it make a laugh! looking forward to the next one. Well done Danny. Despite all the drama you encountered, you persisted and finished top 50% in your first Jamboree XC race. Impressive indeed. Well done guys! Everyone who complete the race is a winner.